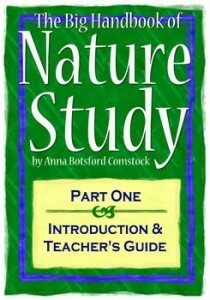 If you head over to homeschoolfreebie.wholesomechildhood.com today, you can download two portions of The Big Handbook of Nature Study by Anna Botsford Comstock. Further portions will be available the rest of this week, so keep stopping over each day! Comstock’s book is an extensive volume of nature study with beautifully written passages on birds, fish, animals, insects, and more. Written originally in 1918, she has plenty of thought-provoking questions in each unit. One good one involves hunting and stewardship of our natural resources. You don’t typically see these sorts of critical thinking processes in today’s science books. As a side note, our Nature Study section of the shop has a book, The Herbarium, which is a plant collection book, written with The Handbook of Nature Study in mind. Be sure to download this great resource– don’t miss it!